Select from Waxxxie's complete range of Salon Professional quality after wax care products. With a gentle and low heat formula for professional results on the bikini line, face and underarms. Available in a 7oz jar. Salon Wax’s gentle, creamy formula is your skin’s waxing savior in a jar! One treatment with this low heat, salon style wax on sensitive and delicate areas, and your skin will be buoyed with a new found softness and smoothness. And you’ll feel the need to slip on a skin baring bikini! 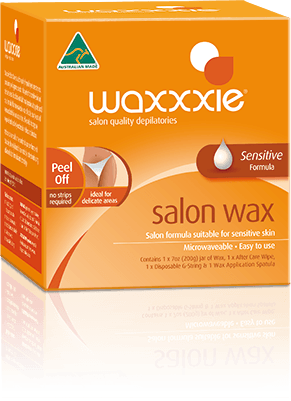 Based on Australia’s most popular professional wax formula, Salon Wax has a low heat, Microwaveable formula, and is very flexible, removing coarse and fine hairs easily and effectively. No strips required!